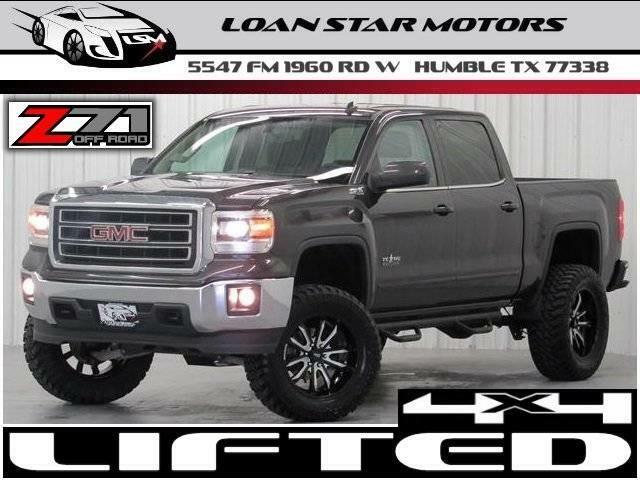 2014 GMC SIERRA 1500 SLE CREW CAB Z71 4WD LIFTED 5.3L ECOTEC3 4X4 BRAND NEW LIFT KIT BRAND NEW 20 INCH MOTO METAL WHEELS AND NEW 35 INCH MUD TIRES 100% AUTOCHECK GUARANTEED WE FINANCE WAC. Call us now for more details 800-651-1718 At Loan Star Motors we offer the lowest rates and loan terms for your best deal. We have teamed up with many financial institutions to provide you with the best financing options possible. At Loan Star Motors we AutoCheck every vehicle before purchase and do a DMV background check. Welcome to the Loan Star Motors Family. Thanks for shopping our inventory and we look forward to assisting you in your next purchase. WWW.LOANSTARMOTORS.COM We stand behind our product with a low cost 30 day warranty on all Domestic and Import model vehicles. At Loan Star Motors, we offer financing as low as 1.99%. NO CREDIT - BAD CREDIT REPO - BANKRUPTCY - E-Z SPECIAL FINANCING OPTIONS. Family environment, Upfront & honest! Call Now & See How Easy It Is! College Graduate Program! Great Discounts for Military, Police, and Fireman! PHONE: 800-651-1718 The GMC SIERRA 1500 SLE CREW CAB Z71 4WD LIFTED 5.3L ECOTEC3 4X4 NEW LIFT's pristine good looks were combined with the GMC high standard of excellence in order to make this a unique find. Simply put, this Four Wheel Drive is engineered with higher standards. Enjoy improved steering, superior acceleration, and increased stability and safety while driving this 4WD GMC SIERRA 1500 SLE CREW CAB Z71 4WD LIFTED 5.3L ECOTEC3 4X4 NEW LIFT. This is about the time when you're saying it is too good to be true, and let us be the one's to tell you, it is absolutely true. More information about the 2014 GMC SIERRA 1500: The redesigned 2014 GMC Sierra 1500 lineup comprises a set of pickups aimed at a wide range of uses from personal transportation to purpose-built tow rigs, farm or ranch haulers, or off-road machines. With three cab styles, two bed lengths, three engines, 2WD and 4WD versions and various trim levels from spartan to lavish, the Sierra lineup offers something for all. Top-of-the-line Denali models remain the choice of more discerning (and affluent) truck shoppers, with luxurious interiors and the full set of features of a premium SUV. The Sierra is significantly quieter than last year's models, as well as most other trucks in its class, thanks to a host of new sound-deadening additions like triple-sealed doors and new aerodynamic measures. The Sierra's engines are stronger yet more fuel-efficient than before, while also more refined. GM boasts that models with the V6 have towing ratings of up to 7,600 pounds, which is hundreds of pounds more than a comparable Ford F-150 or Ram 1500. Also, the Silverado 1500 might have some of the lowest maintenance costs among pickups because of its 4-wheel disc brakes with Duralife rotors, which GM claims will last twice as long as conventional brake rotors. This model sets itself apart with Strong, efficient engines, quiet, stylish cabins, innovative cargo solutions, and upgraded connectivity and entertainment systems WE OFFER NATIONWIDE FINANCING OPTIONS, COMPETITIVE RATES, DISCOUNTED SHIPPING AND WELCOME TRADES. Extended warranty programs and low APR financing available (With Approved Credit). Toll Free 1-800-651-1718 Visit us on the web at http://www.loanstarmotors.com All advertised prices exclude government fees and taxes, any finance charges, any dealer document preparation charge, and any emission testing charge. The price for listed vehicles as equipped does not include charges such as: License, Title, Registration Fees, State or Local Taxes, Dealer Prep, Smog Fees, Credit Investigation, Optional Credit Insurance, Physical Damage of Liability Insurance, or Delivery Fees. DEALER makes no representations, expressed or implied, to any actual or prospective purchaser or owner of this vehicle as to the existence, ownership, accuracy, description or condition of the listed vehicle's equipment, accessories, price, specials or any warranties. Any and all differences must be addressed prior to the sale of this vehicle. Your actual mileage will vary depending on how you drive and maintain your vehicle.